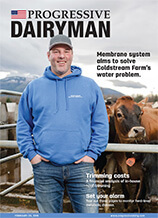 The April 19, 2019 issue of Progressive Dairyman offers some tips on milk quality. Pick up on a few key performance indicators to help you stay in control. Also included is A.I. and breeding. Learn how to right-size your herd to lower expenses and create a stronger replacement heifer program. Or learn more about what a “four-event” cow is and how she can impact your bottom line. Lastly, learn how to make milk for less than $15 per hundredweight. To view a list of aricles from a past issue, click here. Once on the "Article List" page, just click on the issue that you want to view the list of articles for. 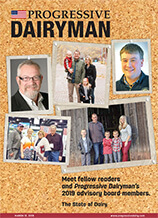 The first issue of Progressive Dairyman features an unconventional subject, dairy breweries. See how one operation established a brewery on-farm to increase income. Or find out how a distillery was able to turn milk byproduct into a smooth vodka – it is selling out quickly. Lastly, check out this milk byproduct that’s fermented like beer. Also included is calf and heifer raising. Follow these four tips to help your calves de-stress, and find out how many replacement heifers you need to raise to stay profitable. In this climate, it’s not ideal to raise more than needed. Also do not miss our columnists, Yevet Tenney, Ryan Dennis and Tim the Dairy Farmer. 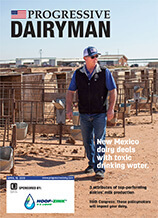 The second issue of Progressive Dairyman focuses on management, including organic management. Learn how to articulate why your farm exists, or learn how to solve problems within your farm partnership by reading “Five Fingers” by Mark Andrew Junkin. Also, hear from Editor Karen Lee about how to achieve more on your farm by carving out a time each week to strategize. 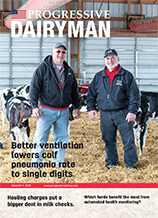 The third issue of Progressive Dairyman focuses on feed, forages and nutrition. Find out what you can expect from 2018 silage and how you should feed it. See these four concerns about feeding large quantities of concentrate in automated milking systems. Or get the basics of why DCAD diets work, and whether there is a difference between partial- and full-DCAD diets. Another focus of this issue is finances, margin and risk. Find out how you can increase revenue and cash flow. 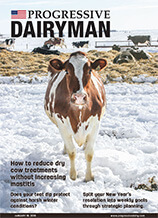 The Feb. 25, 2019, issue of Progressive Dairyman covers a good smattering of topics, including management, dry and transition cows, animal welfare, hoof health, A.I. and breeding, and manure handling. Should we feed a different diet to fresh cows? See the research on high-starch diets for fresh cows here. Also, find out why you should continue to use footbaths during the winter and how you can accomplish it. Lastly, see how this group of farmers are holding themselves to higher environmental standards, beyond what regulations require. 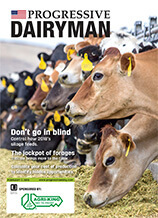 The March 12, 2019, issue of Progressive Dairyman outlines the “state of the dairy industry.” Check out how your region is doing and what to expect for the next year. Also included is calf and heifer raising. Find out what auto-feeders have taught us about feeding calves, and how they have challenged dairies to rethink calf-raising strategies. Or see how this couple raises dairy-beef calves for the feedlot. Lastly, explore whether a high-nutrition or moderate diet is economical for your calf-raising program. Warmer weather is on its way, if not already here. 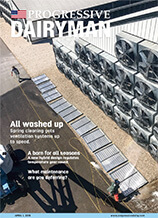 The April 1 issue of Progressive Dairyman takes a closer look at cow comfort and cooling. What is the cost of comfort? See this new research that analyzes the costs of seven different dairy barn ventilation systems. Or learn these key indicators to measure cow comfort in your herd. Lastly, are your cows getting enough water? See how you can encourage water intake to increase milk production. This issue also touches on facilities and design. Find out the pros and cons of four different robot configurations. Or check out this new ventilation design: the all-seasons hybrid barn.